If one is serious about HT, and not just music, then the centre speaker forms a big part of the experience. Just switch off the left and right and see how little you lose. I feel that using a phantom speaker, or compromising on the centre is not what a true HT fan should do if he/she wants the best cinema experience. Having a equal or better center speaker rather than using the phantom mode is vital. I just watched "Gravity" on BR and it's a very good demo disc. Most people will use the bass scenes, but it's actually much more. It's also a good test of the tonal matching of your front three speakers, and also the position. When Sandra Bullock hallucinates that George Clooney is alive and comes into the spacecraft, you get a cacophony of sound, and he moves from right off screen to centre and round the sides. You also get a bunch of sound effects of switches, and you should be able to locate where the switches are with your eyes closed and hear that George's voice sounds consistently the same as he pans from one side to the other. There should not be a different tone and the height of his voice should also remain the same. Does your setup achieve this? and it's worthwhile trying the scene out without a centre to see how well your HT system handles transitions from speaker to speaker. It's a sad thing to see great stereo speakers paired with a weedy centre. Also phantom mode works if one is seated near the centre. Otherwise there is nothing to lock the dialogue to the screen. Check it in the next movie you watch. Does the sound come from the TV or below? And try out the scene above.. If one is able to use identical speakers, like the KEF LS 50 for all three speakers that will be great, or three units of the B&W 800 such as what they do in the Abbey Road Studios. Otherwise a simpler setup is a pair of B&W 805 and a HTM4, which is essentially the same speaker on it's side. Bear in mind the issue of lobing, which happens more frequently in MTM speakers. Speaker designers try to get round this by using 2 1/2 way speakers, or placing the tweeter in it's own housing, and or the KEF / Thiel solution of a coaxial speaker. I have used the Polk Audio CS 150, which is a fabulous entry level centre, using a passive radiator on one side, then the KEF Reference 100 centre, a superb centre with great voicing, only lacking the ability to play loud. I also used the Dynaudio C 120+, a big centre which was one of the first for Dynaudio, using an OEM box with it's own speaker cones. 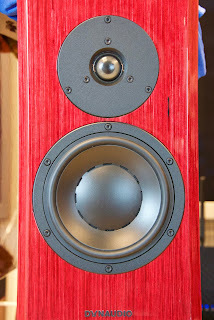 Then the MA series and they make very decent HT speakers. I then used the PSB Alpha series, and even though they weren't high end stuff, tonal matching made the experience very enjoyable. When I reached the MA Gold LCR, this is one of the best for the money, and it's ability to reproduce the male voice made it one of the most realistic centres for the money. But when I reached the B&W 800 series, even with a single woofer, the HTM4, was unbelievably accurate. Sure it can't play as loud as bigger cones, but you get almost a point source, and sometimes when I forget to turn on the stereo amp which powers my front pair, I lose very little. To see if the centre does a good job, try listening to BBC radio for it's baritone voice. Then try Transformer I, the opening scene when there is a voice-over by Optimus. See if you believe that Peter Cullen's deep voice is really there or a weedy reproduction of it. Another good voice to try is of course Darth Vader's voice. Earl James' rich tone should come over nicely, or it's time to upgrade your centre! To follow on, IMHO, I think it's worthwhile making a distinction when we use talk about avoiding centre speakers from a lower range. Let's use Dynaudio and Monitor Audio as examples, although it can apply to many other brands. If one uses say the Confidence series and perhaps the MA Platinum series, and combines that with a DM series centre or a Bronze series small centre, that will be quite different, and a big compromise. That's a no no. However if we use a speaker, say the SCX with the Confidence series, that can be a possible compromise for those who are not into HT and occasionally dabbles with HT. Spend a lot less, but get a significant amout of the better centre. Then Audyssey tries to make up the difference. So is that a big compromise? That depends, on the design as well as the frequency range and of course the type of drivers, and how different they are compared to the front speakers. Imagine using a C4 with a tiny centre? Will the centre carry the sound? Or the MA PL 300 with a tiny Bronze series centre. I looked at the older Spendor S6e before, but they used a pathetic OEM box of a centre speaker as Spendor isn't known for HT. It was a token effort meant to appease the few Spendor owners who might dabble with HT. But the SCX drivers are very good and the frequency response is nothing to laugh at. In the same vein, the MA GOLD series 350 centre is a massive effort by a company who does HT well. I think in these cases, you can get away with a compromise. But before someone replies that compromises are no good, I AGREE. But for the cost conscious who have elected to put most of their monies into the front pair, and then want to add a centre, then it can be considered to get a good centre, with drivers that come from a good design albeit not entirely matching their fronts. Not everyone can afford 3 B&W 800 for the front three. But owning three KEF LS 50 for the front three channels can give a better HT experience than mismatching speakers. It all depends on where your priorities lie: music with the occasional HT, or a full on HT system. Then perhaps buying a lower series, but keeping all the drivers in the same range may be better and give a much better HT experience. Finally speaker placement and room acoustics can be far more important than merely spending big bucks on expensive speakers stuffed into the corners of a tiny room with a misplaced centre speaker.. So sometimes using a lower series centre is better than no centre.. Finally, even within the same series, size matters. For example the MA Gold 350 is a far better centre than the 150 in larger room, but in smaller rooms, and if you crossover at the right frequency to a good sub, it can be a decent compromise. But bear in mind the lower GXC 150 is a MTM design, which can give issues with lobing, whereas the position of the tweeter is better in the bigger GXC 350. But if we did audition different centres, some brands may actually sound the same. But it's harder to predict, hence we stick to the same brand. DIY jobs can be very good, say an effort by bro synthesis is of the utmost QC, but other efforts may not be the same, quality drivers not withstanding. If the crossover is too high, the bass and hence the baritone voices will sound unnatural, as it seems to emanate from the sub instead. So it's not a simple task of buying an expensive front pair and saying phantom works for me, or buying an expensive centre and hoping all is well. As with most things in HT, calibration, position and settings all play their role. 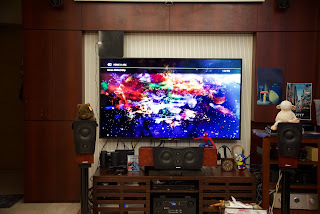 Many members place their centre speakers far from the edge of their console. This may be aesthetically pleasing but causes more problems. The issue is diffraction of sound, and the edge interferes with the diffusion of sound. So as far as possible, place it on the edge of the console / shelf. And speaking of shelves, a solid and stable platform is best. Bookshelves, or flimsy shelves are not idea. Adding good support, eg Auralex MoPads is a good idea. And if the speaker shares the space on the console with a CD / BR player, isolation from the vibrations of the speaker will be important.